My first Conclave was held at Camp Chief Logan, near Chapmanville, West Virginia. It was hosted by Adjudimo Lodge 210. I have been trading for conclave patches ever since. I have been collecting conclaves since attending my very first conclave in 1972, at Camp Chief Logan. This was the last Area 4F conclave. I have been hooked ever since. This site will be helpful to those wishing to collect Ohio and West Virginia conclaves. While I have posted many images, there are many more to come. I also need images. If you have one I need, please email it to me at: hytone416@hotmail.com. Also, if you wanna trade me something I need, please email me. I grew up in Southern West Virginia, in troop six, in Beckley, WV, in the now mergered, Appalachian Council. I became a member of Hytone Lodge 416 in the spring of 1972 and sealed my brotherhood in the order in 1973. I was elected lodge chief of Hytone Lodge at the Winter Banquet in 1975. Later that fall, I would be selected as Section Chief, of Section EC-6B for 76-77. I became a Vigil Honor member of Hytone Lodge in 1976. I was a charter member of Chi-Hoota-Wei Lodge 617. The lodge is a merger of Hytone 416, Adjudimo 210, and Wachu Menetopolis 475. 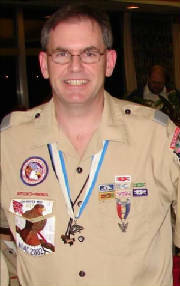 I was the first Lay Advisor of Chi-Hoota-Wei Lodge. I i am now a member of the new Takhonek Lodge 617 which is a merger of Chi-Hoota-Wei , Thal-Coo-Zyo 457 and Nendawin 618. I have attended and served on the staff of several NOACs and many Jamborees. I have been on the Jamboree staff of QBSA Radio four times and at the 2013 Jamboree this summer, I was the host of the QBSA Morning Show. The Summit Jamboree site is 5 minutes from my hometown of Beckley, West Virginia. I am a 1982 graduate of Glenville State College with a degree in Biology and General Science Education. In 2008, Discovery Education and the 3M Corporation named me America's Top Science Teacher. That same year, I was named the Glenville State College Alumnus of the Year. I am currently a retired science teacher from Mount View High School in Welch, West Virginia. I am a past President of the West Virginia Science Teacher's Association. in the Summer of 2019 I will attend the World Jamboree as an Assistant Scoutmaster. I am also a member of the West Virginia Legislature. I currently represent McDowell and Mercer Counties in the House of Delegates. I also enjoy Amateur "ham" radio. I hold an Extra Class license. My call is WV8ED. I can be found on www.qrz.com by looking up my call. 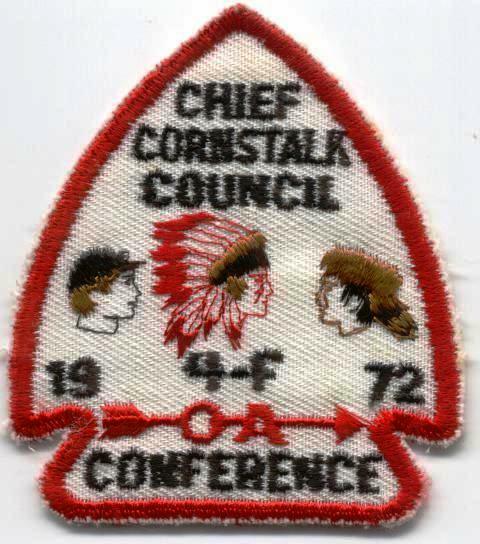 At the 1977 NOAC, I went over to the Pre-NOAC traderee. I really learned how much fun this hobby could be. I have been hooked ever since. I collect West Virginia OA, West Virginia CSP / SAP's, and West Virginia and Ohio Conclaves. I have a big big ole CSP collection gathering dust in the basement and I am a number collector for OA Lodges, just one of each, regular issues. 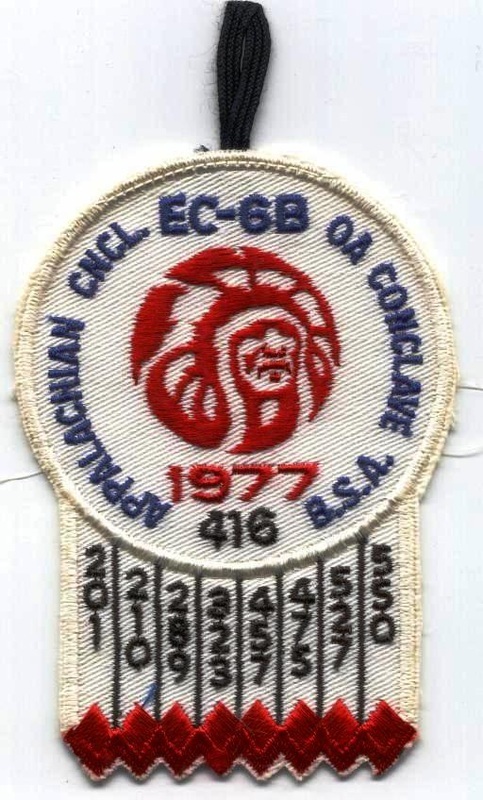 My year as Section Chief for EC-6B in 1977...Yeah it's a really tough piece!!! I was the section chief and I was only able to get one patch. It's the patch I recieved with my registration....GOT ONE TO TRADE??? ?